In this advanced workshop you&apos;ll develop a strong, personal connection with your spirit guides and angels. Learn which ones to call in for healing, protection, spiritual guidance, finances, and romance. In addition, you&apos;ll experience your "Life Between Lives," the period when your soul was in the White Light preparing for your current incarnation. Discover why you incarnated this time around, and why you chose your family members, etc. You&apos;ll then enter the celestial Hall of Records and view several of your past lives in your personal holographic lifebook. Finally, you&apos;ll also learn techniques for programming and remembering your nightly dreams. As always, Ross will heal any karmic aches, pains or emotional issues that come up during the workshop. Class space is limited, so register early. 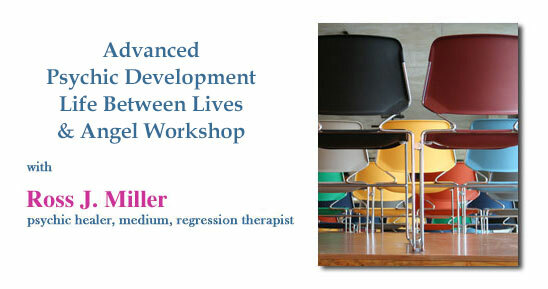 Class Requirements: This advanced workshop is for those who have either taken Ross&apos; one-day "Introductory Psychic Development, Past Lives & Angel Workshop" or those clients who have learned how to connect with their guardian angels and spirit guides and who have also been regressed back to one or more of their past lives. If you&apos;re in doubt as to whether you qualify, please call or email Ross. Ross J. Miller is a professional psychic healer, medium, regression therapist, and dream interpreter with over 25 years experience guiding people worldwide. His psychic readings and healing sessions can be done in person or by telephone. His practice is in Newton, Massachusetts. $275 (a $175 deposit is required to reserve your place). Please make out your $175 deposit check to: Ross J. Miller, and mail it to: Ross J. Miller, 1075 Washington St., Newton, MA 02465. Please write the workshop date on your check. The balance will be due at the workshop and can be paid by cash or personal check. If at the last minute you&apos;re unable to attend the workshop, your deposit will be credited either towards a future workshop, a psychic reading, regression, or healing session. Sheraton Needham Hotel, 100 Cabot St., Needham, MA 02494 (the hotel is right on the Newton town line just off of Routes 95/128 at the Newton Highlands exit #19-A). The hotel prefers that no food or beverages be brought on site. I suggest that workshop participants eat lunch in the hotel&apos;s lobby restaurant. The food is inexpensive but very good. A notepad and a pen. Wear comfortable, loose-fitting clothes. Also, please bring a sweater or a jacket since the air conditioning can sometimes make the room seem cold. Don&apos;t forget to tell your friends about the workshop. Please complete the registration form below and email it to Ross, or call Ross at (617) 527-3583. Please remember to mail in your $175 deposit. See mailing address above in the Cost section.